Moderately moist to dry. River banks, streamsides, roadsides, railroads, and other disturbed sites. Gravelly or sandy soil. Full sun. This is an erect, annual, 4″ to 16″ tall forb that rises usually on a single stem from a taproot. The stem is round, green to reddish-purple, sparsely to moderately branched, and covered with two types of hairs. It is densely covered with minute, spreading, gland-tipped hairs, and moderately to densely covered with longer, matted hairs that are often also gland-tipped. It is sticky to the touch and has a disagreeable odor when crushed. The leaves are alternate. 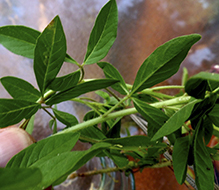 Lower and middle leaves are on ⅜″ to ⅝″ long leaf stalks (petioles) and are divided into three leaflets (ternately compound). Upper leaves are undivided and are on shorter stalks or are nearly stalkless. The petioles are green to purple and are densely covered with gland-tipped hairs. At the base of each petiole there is an inconspicuous, hair-like, less than 1 ⁄32″ long appendage (stipule). The stipules whither quickly and may not be visible except on very young leaves. The leaflets are narrowly egg-shaped or inversely lance-shaped, ⅜″ to 1⅝″ long, and ⅛″ to ½″ wide. They are narrowed or tapered at the base and usually bluntly pointed, sometimes sharply pointed, at the tip. The upper and lower surfaces are covered with gland-tipped hairs. The margins are untoothed. 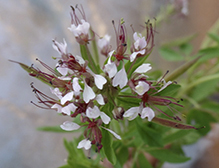 The inflorescence is an unbranched, flat-topped, usually dense cluster (raceme) of many flowers at the end of each stem. The raceme on the central stem can be up to 8″ long, one-half the length of the stem. Racemes on side stems are shorter. The flowers are on green to purple, 3 ⁄16″ to ¾″ long stalks (pedicels). Each pedicel is subtended by a lance-shaped to egg-shaped, 5 ⁄16″ to ⅝″ long, 1 ⁄16″to 3 ⁄16″ wide modified leaf (bract). Each flower is about ¼″ long and bilaterally symmetrical, having only one plane of symmetry. There are 4 sepals, 4 petals, 6 to 10 stamens, and 1 style. The sepals are purple, oblong, 1 ⁄16″ to ⅛″ long, 1 ⁄32″ to 1 ⁄16″ wide, and fused at the base. The petals are usually white, sometimes pinkish. They are spatula-shaped, ⅛″ to ¼″ long, 1 ⁄16″ to ⅛″ wide, and narrowed to a stalk-like, 1 ⁄32″ to ⅛″ long base. The upper pair of petals are longer than the lower pair. The upper pair and usually the lower pair are shallowly and broadly notched at the tip. The stamens have purple, 3 ⁄16″ to ⅜″ long stalks (filaments) and purple, 1 ⁄32″ long anthers. They are unequal in size because they mature at different rates. At maturity, they are as long or only slightly longer than the upper petals. They wither away after fertilization. The pistil is borne on a short, 1 ⁄16″to 5 ⁄16″ long, stalk-like extension (gynophore) of the the receptacle. The gynophore does not elongate as the fruit matures. The style is 1 ⁄32″ to ⅛″ long. The stigma is purple. The flowers bloom from the bottom up. 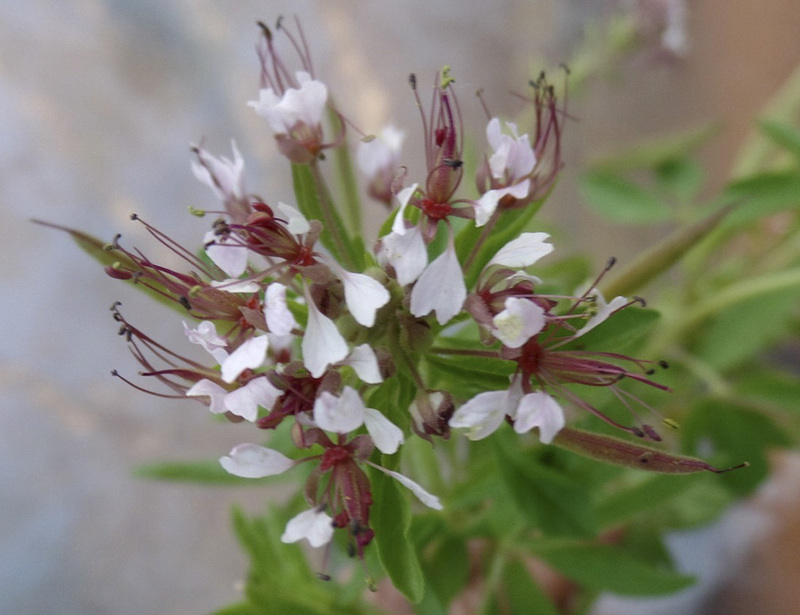 The raceme continues to elongate as fruits develop, eventually becoming 4″ to 11 ¾″ long. 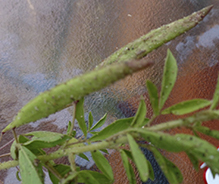 The fruit is a pea-like, oblong, slender, cylinder-shaped, 1″ to 2″ long, ⅛″ to ¼″ wide capsule with 20 to 65 seeds. The capsule is green at first, turning brown as it matures. It is inflated and densely covered with sticky glandular hairs. It is held erect or strongly ascending. The style drops off as the fruit forms. Sandyseed clammyweed (Polanisia dodecandra ssp. trachysperma) is a larger plant, 12″ to 24″ tall. The leaves are larger and on much longer petioles. The flowers are larger and have more stamens. Mature stamens are about twice as long as the upper petals. The fruits are slightly larger. It is the western subspecies and mostly restricted to the western half of the state. Sources: 4, 24, 28, 29, 30. Sources: 6, 7, 22, 24, 27, 29, 30, 72. The stem, foliage, and fruit are covered with sticky glandular hairs. Touching them leaves the fingers feeling “clammy”. A long or short, stalk-like extension of the receptacle on some flowers on which the pistil is borne. The thickened, upper part of a flower stalk to which flowers or flower parts are attached. In composite flowers, the part on which the florets are borne. In accessory fruits the receptacle gives rise to the edible part of the fruit. A small, leaf-like, scale-like, glandular, or rarely spiny appendage found at the base of a leaf stalk, usually occurring in pairs and usually dropping soon. Refers to leaves that are divided into three leaflets or sections.